Back to school is right around the corner. While you’re signing up your kids for sports, clubs and other activities, don’t forget your own options. We have a place for you to make a difference with the chamber! Since chamber membership is a corporate membership, any employee of a member business is encouraged to volunteer for the chamber. We’ll find a place for your skills to shine! Serving on a chamber committee creates added value for your membership investment. When you (or your staff) volunteer you gain exposure for your business, add value to your investment, discover new skills, meet new people who can become customers, (or great friends), and contribute to our community. For the time invested, that’s a lot of added value. The chamber has at least 3 types of volunteer opportunities available. First there are the standing committees. These committees are in operation year round and meet on a regular schedule. They are Ambassadors, Board of Directors, Government Relations, and Membership. Secondly, there are several event committees. 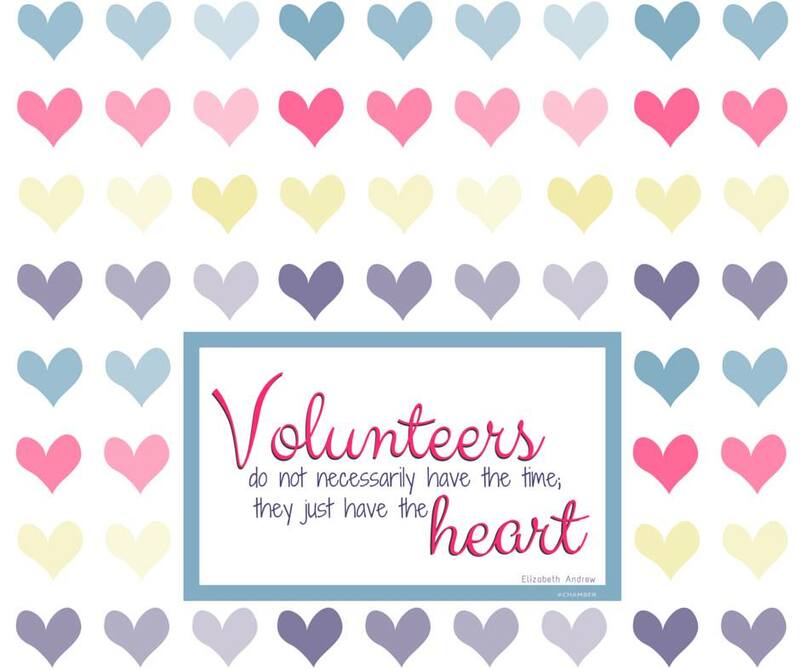 Volunteers can either serve on the planning committee of our plan major events or help by serving as a “Day of Event” volunteer, where we need extra hands for set up or executing the event. The major events at this time are: The Fall Event, Business Expo, The Golf Classic and Shiver Elk River. The third type of volunteer opportunity involves short term task forces that answer and resolve one time needs such as Transportation, Signage, Building Remodeling, Program Updates etc. Below are more details about the standing and event committees as they are structured today. Each of these committees evolve as new volunteers join them. Ambassadors serve as a goodwill link to our members and the community. Key initiatives are to welcome new businesses, recognize business expansions and attend ribbon cutting and open houses. They meet on the 2nd Wednesday of each month from 1:00 pm to 3:00 pm. There is an attendance policy of 75% and your business must be a member for at least 2 years to become an Ambassador. Board of Directors As directed in the By Laws, the Board of Directors is responsible for the policies, property and finances of the chamber organization. They meet monthly and are chosen by a nominating committee in the spring. Terms run three years. Government Relations reviews public policy platforms and makes recommendations to the full Board of Directors. They host Candidate Forums and meetings with elected officials. This committee meets as needed throughout the year. Membership Committee Reviews membership policies and calls on prospective members to share the value of joining the Elk River Area Chamber of Commerce. The Fall Event is the chamber’s annual social event held on an evening in the fall. This event typically includes a meal, a silent auction as well as games and entertainment. The purpose is to connect members and raise funds for the chamber. The committee meets from May until the wrap up after the event. Business Expo is held in the spring each year. This is a showcase of area business products and services. The committee meets from November until the wrap up after the event. Golf Classic is held in June or July and rotates between golf courses that are current members. The committee meets from January until the wrap up after the event. Shiver Elk River is a winter community celebration that includes outdoor winter activities, a 5K & 10K Run, and a Hockey Tournament. A central feature is the Plunge that helps to support area nonprofits. Committee meets from late summer until the wrap up after the event, which is held in February. Call the chamber to learn more about the opportunities that are available. With your time and talent you, your business and your chamber will continue to grow.